We all want our pets to be happy, healthy, and live long lives as our beloved companions. When they become overweight or obese, their chances of living this kind of life are diminished. According to the Pet Obesity Prevention Association, more than half the dogs and cats in the United States are considered overweight or obese. I don't know about you, but I was blown away by that number. My Saffy has struggled with her weight on and off throughout her 15 years. With the help of her vet and a change in diet and exercise habits, she finally leveled off at a healthy size. 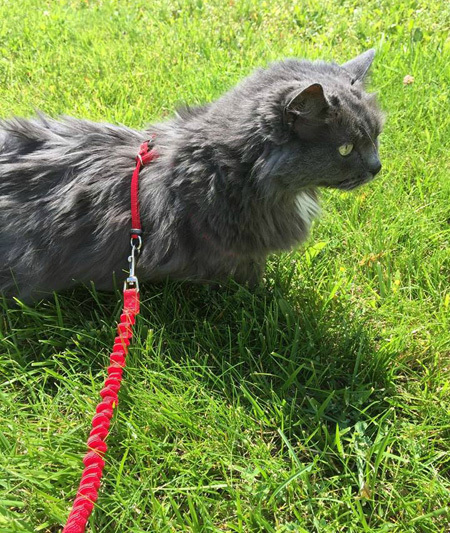 And we discovered she likes to walk outside on a leash and harness! In fact, she now believes she's the wild huntress of the neighborhood, and all chipmunks cower in fear of her majestic ways. We let her go ahead and believe that. It's a small thing. The huntress burns off calories AND intimidates chipmunks! 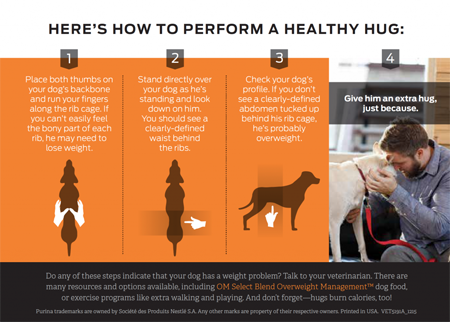 Purina® Pro Plan® Veterinary Diets OM Overweight Management formulas help pet owners properly assess their pet's weight and offers healthy living tips so we can enjoy a long, happy life with our fuzzy pals. Here are three easy steps to determine if your pet's weight is healthy. Same goes for cats! Click for larger image. Should you discover your pet has a little extra -- um -- fluff, it's good to know it's easily managed with a low calorie, low fat diet and the right amount of healthy habits. 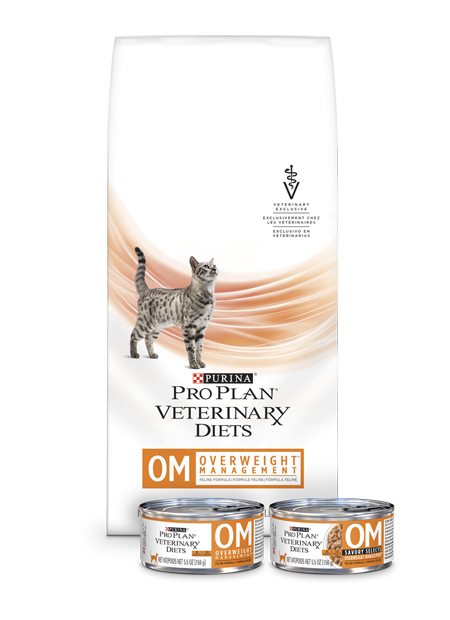 Purina® Pro Plan® Veterinary Diets OM Overweight Management formulas are low in calories and fat, high in protein, provide natural fiber, and promote urinary health. The proper amount of food, reduced treats, combined with regular exercise is the best way to keep your pets lean and mean (in a good way, that is). Even if your cat is lazy by nature, find that special something that gives him a spring in his step and go for it! 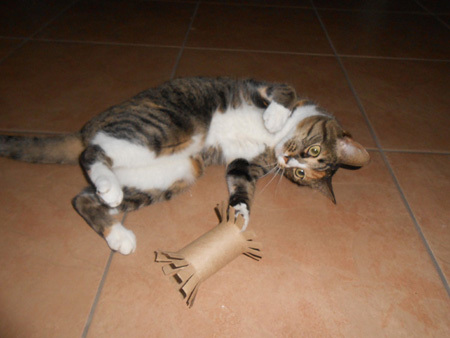 Sometimes homemade toys get the most action. Two (2) winners will each receive one (1) coupon for up to $60 worth of free Purina® Pro Plan® Veterinary Diet canned or dry food (must be redeemed at authorized veterinary clinics). The coupons can only be redeemed in the U.S.; however, anyone can enter and donate the coupon to a U.S. shelter or friend. To qualify, enter via the Rafflecopter widget below. 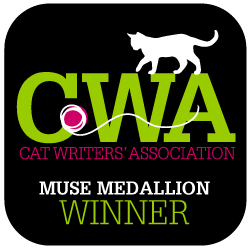 You can score additional entries, too! I was compensated to help spread the word about Purina® Pro Plan® Veterinary Diets OM Overweight Management formula. Catladyland only shares information we think would be of interest to our readers. The opinions are our own.